Fellowes Loose-Leaf CD Binder Sheets made of vinyl in three hole punched design allows the sheets to fit in three-ring binders. 100% recyclable clear sheets protect discs from dust and dirt. 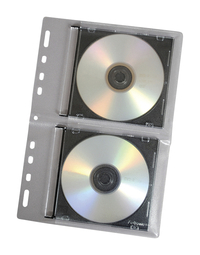 Individual loose-leaf sheet can hold two CDs or DVDs with or without jewel cases and sold as 10 per pack.